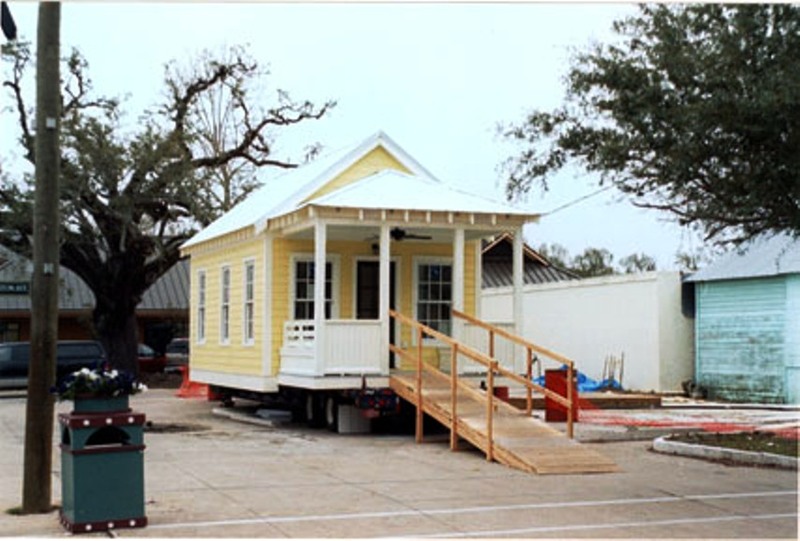 In early 2006, less than six months after Hurricane Katrina blew apart Mississippi’s coastal communities and flooded New Orleans, a prototype Katrina Cottage designed by Marianne Cusato at the 2005 Mississippi Renewal Forum in Biloxi was put on display at the International Builders Show in Orlando. 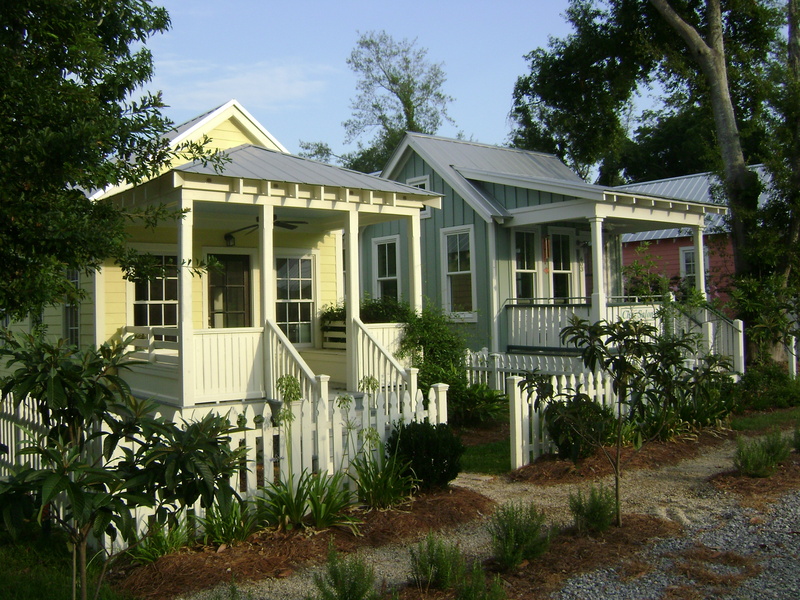 Cusato’s 308-square-foot, Mississippi-vernacular design was one of several in the Katrina Cottage portfolio our architecture team developed during the Forum. The idea was to offer housing that could be, in the short run, a safer, more livable alternative to Federal Emergency Management Agency (FEMA) trailers as emergency housing, then transition to permanent homes in permanent neighborhoods. At the time, it seemed a no-brainer. With tens of thousands of Mississippians made homeless by the storm, and with a mandate from then-Governor Haley Barbour to “build back better than ever,” this was a housing market driven by a sense of urgency. It was an environment made for new thinking about homes and neighborhoods in a new era. But in Mississippi and Louisiana, the hunger for new solutions diminished at about the same rate federal recovery money flooded state and local agencies. And in the hands of local governments, those dollars targeted the priority of getting things back to normal as quickly as possible. Which meant, in most places, conventional suburban development with large homes on large lots at un-walkable distances from employment, shopping and recreation. and, once the cottages were available, battles with community groups panicked that small-scale homes built with government help would turn into crack houses. In Mississippi, the principal rare exception was the town of Ocean Springs. There, thanks to historic models of walkable urbanism, sympathetic local officials and the tailwind from the Mississippi Renewal Forum, we created a development partnership for a mixed-use infill project of small structures on narrow lots: Cottage Square. 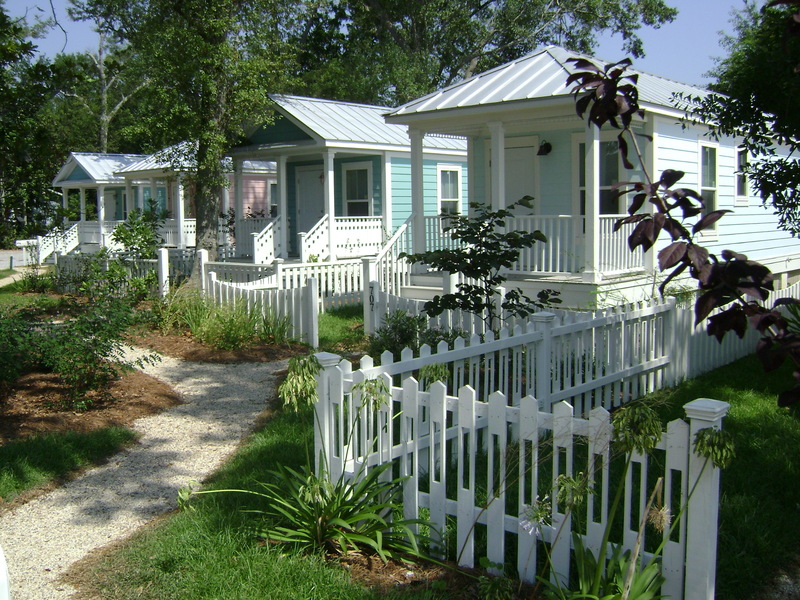 Between 2006 and 2010, Cottage Square became permanent home to seven Katrina Cottage designs, including Cusato’s original “little yellow house,” a Louisiana-vernacular model built during a 2006 charrette in Saint Bernard Parish, and two designs by Steve Mouzon, another pioneer of the Katrina Cottage movement. The structures, all designed to withstand 140-mph storm winds and all elevated to accommodate federal flood-plain rules, ranged from a 200-square-foot Mouzon studio to a 1,300-square-foot, two-story unit that houses Bruce Tolar’s architecture office. During the Forum, we argued for FEMA to divert at least a sliver of the hundreds of millions of dollars in emergency housing relief to what we saw as better solutions for the long haul. But because of FEMA’s statutory mandate to stick to temporary emergency strategies, the agency resisted. That debate was soon joined in Washington, where Mississippi Governor Haley Barbour and the legislative delegations of his state and of Louisiana had substantial sway. The result was that in June of 2006, Congress provided $400 million for an Alternative Housing Pilot Program for FEMA to develop and test alternative designs for disaster housing. And FEMA began working with emergency agencies in the five hurricane-affected Gulf States — Texas, Louisiana, Mississippi, Alabama and Florida — to get units into recovery areas. It was a classic “be careful what you wish for” situation. For each level of bureaucracy the funding had to clear, there were new layers of regulatory, design and engineering guidelines. It was agonizing. And the clock was running. The process forced delays and pushed costs higher. Developers, builders and communities that might otherwise have been interested in participating looked elsewhere for opportunities. Perhaps because we had already devoted so much time and so many resources to making this work, we hung in. During the Mississippi Renewal Forum, many of us became convinced systems-built techniques, including manufactured and modular housing, could help close the gap between the costs of building at the levels of design and materials we demanded and the price points we wanted to target. That assumption would be tested in a hundred painful ways over the next few years. 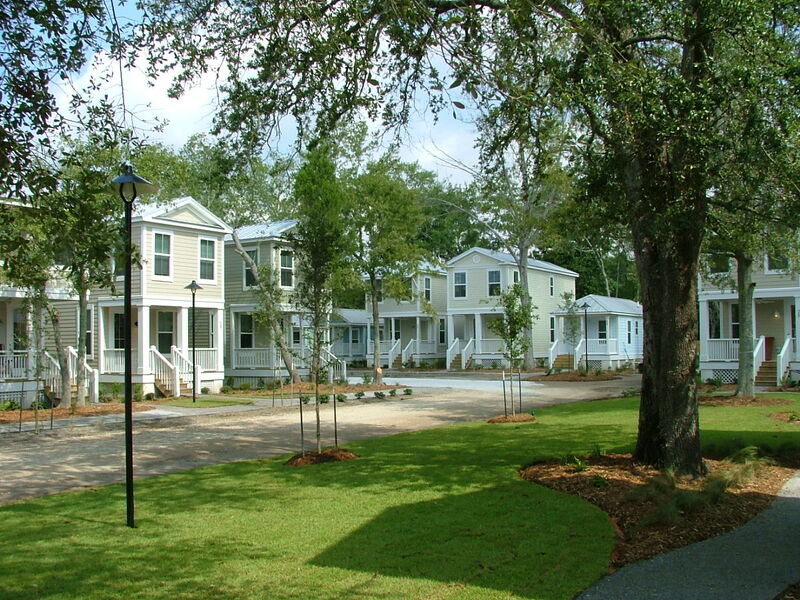 Finally, in 2008, Cottage Square got eight of the first manufactured units inspired by Katrina Cottage designs. Rebranded as Mississippi Cottages, the one-bedroom, 396-square-foot units fell short of the standards of the best designs the Forum team created three years earlier. But when they were settled in place on narrow Cottage Square lots, we immediately achieved two things. First, Cottage Square and the government-funded Mississippi Cottages put to rest concerns that small had to mean ugly and uncomfortable. People lined up to rent them. And the neighbors’ fears subsided. Second, despite the delays and frustrating back-and-forth negotiations, this first batch of one-bedroom units demonstrated the potential of manufactured housing to deliver homes of site-built quality, provided — and this is a big caveat — manufacturers were held to strict standards of design and materials. While the argument over unit costs of manufactured or modular housing compared to site-built structures persists, there’s no arguing about the potential for controlling quality and speed of construction in a weather-proof factory environment. 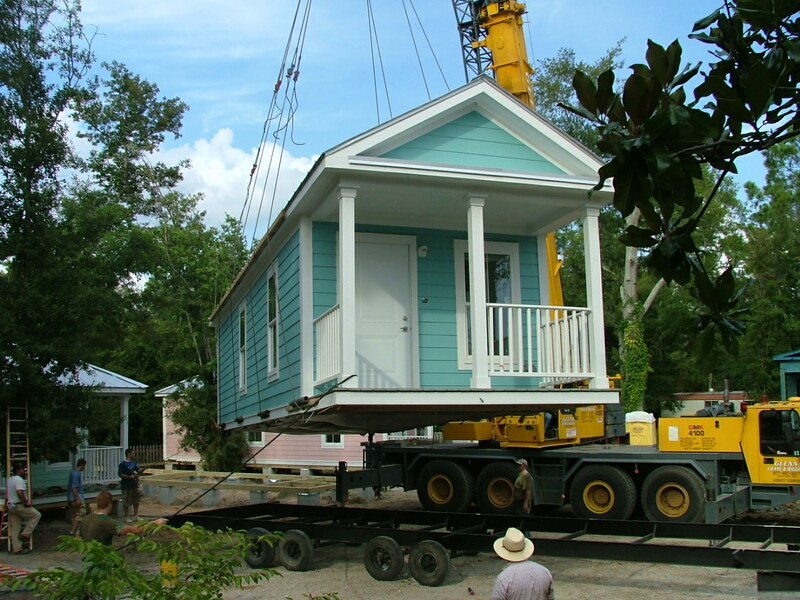 All eight Mississippi Cottages were delivered and set on permanent foundations within four days. That brought our first model neighborhood to 15 units on the two acres. Next door to Cottage Square, where an old trailer park aged into blight, a 29-unit cottage cluster, the Cottages at Oak Park, was completed in 2011. A developer acquired the land. Construction, a mixture of factory and systems-built techniques and conventional on-site work, was financed by funds remaining from FEMA’s Alternative Housing Pilot Program and managed by the Mississippi Emergency Management Agency (MEMA). Units were fully leased within 60 days of Oak Park’s opening. Nonprofit partners — Mercy Housing and Human Redevelopment, Enterprise Community Partners and Gulf Coast Renaissance Corporation — were key players in arranging financing paths and in coordinating rental management for the income-qualified housing programs in both Cottage Square and the Cottages at Oak Park. Their participation made it possible to bridge the gap between entirely subsidized, temporary disaster housing units and permanent, mixed-income neighborhoods capable of attracting private-sector investment. The Cottages at Oak Park included a private developer drawn to such an arrangement. Next, the same combination of partners turned to an even more challenging location in Pass Christian, Mississippi, where Katrina flooding had all but wiped out the town’s neighborhood structures. There, the Cottages at Second Street, another 30-unit cottage cluster, arose in early 2012. This time, the units were elevated eight feet off the ground to accommodate new FEMA flood plain requirements. 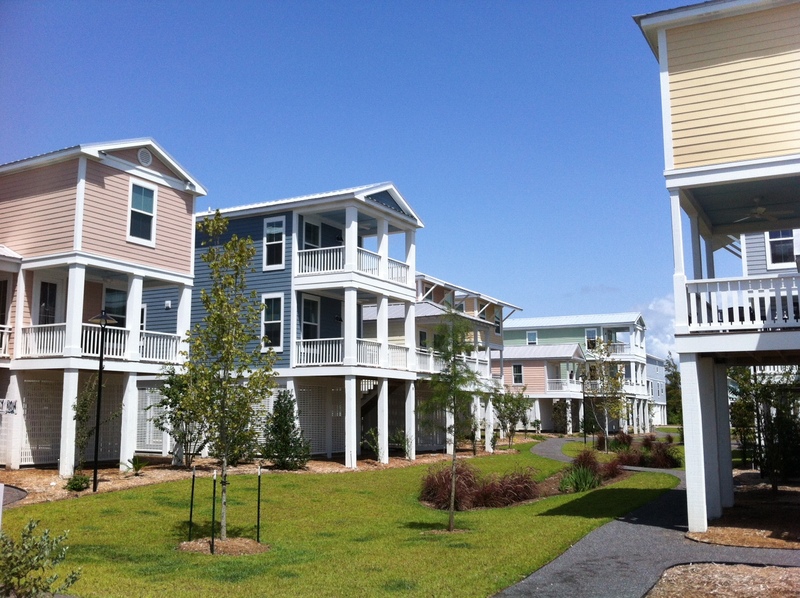 It took seven years, but the opening of the Cottages at Second Street raised the number of permanently located, Katrina Cottage-inspired examples to 70 units in three neighborhoods. All were leased as residences or commercial spaces. All were designed and built with market-rate appeal, yet made viable by public-private partnerships that could be replicated anywhere. A complete model for how to do these neighborhoods was in place. Lessons from the experience are humbling. They’re about realizing how difficult it is to manage the transition from business as usual, even when the usual business ignores a ready-made market. It’s been the better part of a century since well-crafted bungalows, cottages and other small-scale dwellings defined “home” to most Americans — and since designers and builders produced them on a large scale. The metrics of housing value tend to be about size and price per square foot, with big being better and small being for losers. “Affordable” translates to either “subsidized,” which in turn translates to “projects,” or to “mobile homes,” which implies “trailer trash.” Either way, anything small and affordable threatens to lower market values. While this cannot persist as a permanent mindset, it’s nevertheless a perspective that continues to corrupt conversations about community planning and development. Cottage Square and the follow-up projects demonstrated a viable new approach based on market realities. New demographic and economic factors are changing the housing sector. Aging Boomers, 78 million strong, are finding that “aging in place” in car-centered exurbs is more difficult than they thought. Many who can afford the move are looking to downsize in walkable environments. Many who remain will become isolated, causing policy-makers to rethink infrastructure and regulations that inhibit density, mixed uses, and mobility. Millennials, even more numerous than the Boomers, are struggling to launch careers and families with college debt in an economy in slow recovery. Homeownership is lower than for other generations. The same goes for cars. They’re attracted in higher numbers to rentals in urban areas with transit. The gap between supply and demand for walkable, close-in locations is driving up rents and home prices. Mortgage-lending guidelines have been dialed back to the strictest requirements for down payments and proof of income at a time when middle-class families are struggling to overcome devalued net worth and stagnant wages. This is alongside a real estate development/finance/regulatory system shaped to prioritize housing of the wrong type at the wrong price in the wrong places. To take advantage of this broadening market, we should keep in mind what we learned in the Katrina Cottage effort. Small-scale housing needs small-scale contexts. Proposing even beautifully designed 800-square-foot units for neighborhoods in which they’ll be surrounded by homes two or three or five times their size won’t work for residents or for the NIMBYs in the neighborhood. They’re better together, if not in a stand-alone Cottage Square-type infill community, then in what Ross Chapin calls a “pocket neighborhood” of homes site-planned together within a broader residential or mixed-use context. Infill locations rule. You incentivize living in small places with the options available beyond the walls of the home: easily accessible parks and plazas, and places to eat and drink and shop. All without having to get into a car for every task. Design really, really matters. The smaller the space, the more crucial the need for livability and for eye-pleasing detail. This includes interior space — particularly attention to ceiling height, lighting, open floor plans, etc. And it includes the look and feel of what’s just outside the door in the way of landscaping and privacy-protecting features. To overcome the inevitable NIMBY suspicion and the political veto their fears can influence, these little homes have to signal quality and curb appeal equal to or beyond that of adjacent neighbors in bigger dwellings. Partnerships are necessary, at least for now. At some point, the forces of demography and labor economics will bulldoze past the old barriers to attainable housing and small-scale housing clusters, but that will require more examples to demonstrate the opportunities for both private-sector developers and communities that need affordably priced housing. For now that requires strategic collaborations between nonprofits with a track record of bringing resources and expertise to the table and development/construction teams committed to the techniques above.